Al loves owls. They're all he can think of! The walls of his bedroom are plastered with pictures and posters of owls. 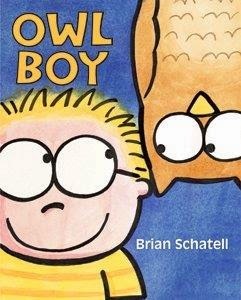 The books on his dresser are all about owl. There's even an owl on his bed - it's stuffed, but still... an owl. When his mom serves meat loaf Al responds, "Owls eat mice." When his dad suggests he go outside to play in the sun, Al explains that owls are night creatures. When Al goes to camp he decides to look for owl nests. And he meets owls! Everything is hunkey dorey until the owl catches two mice: one for himself and one to share with Al. Suffice it to say that Al learns a lot about himself - and being an owl - that night. All about Owls ~ from life history to sound recordings and even a few live "bird cams" from Cornell Lab of Ornithology. Check it out here. Recycle toilet paper tubes and paper towel tubes into owls. Directions here. A maze for young owl-lovers here. Since it's the end of Earth Week (Earth Day was Wednesday), I thought I'd feature a new series of nonfiction for emergent readers. The new series focuses on pollination, and is a "First Step Nonfiction" series published by Lerner just this year. The author is Jennifer Boothroyd, and two additional titles include "Self Pollination" and "Parts of a Flower". opening (from Insect Pollinators): "This bee is busy. It is gathering food." The books in this series show the connections between plants and animals as they depend on each other for survival. Insects and animals need the pollen and nectar from plants, and the plants depend on the animals to move pollen from one plant to another. What I like: The photography is awesome. The text is just right for kids beginning to read, and text boxes include simple explanations. For example: on one page the main text says that an insect crawls on a flower and pollen sticks to the insect. The photo shows a monarch butterfly on a milkweed flower, but we can't see the pollen. So in a text box we read this: "Pollen often sticks to an insect's back, legs, or head." Lest you think bees and butterflies are the only insects pollinating flowers, there are pages showing beetles, moths, and even a fly. Animal pollinators show bats, birds, and even lizards moving pollen. Beyond the book: Pollinators are important. Without them we wouldn't have apples, pears, pumpkin pie, chocolate, blueberries... And Earth Week is a good time to think about them, because we can help pollinators out by making sure they have habitat and water and nectar sources. So, how can we do all this? Follow a pollinator. Next time you're outside and you see a butterfly or bumblebee, follow it around to see what flowers it lands on. How far does it have to fly to find flowers? Go on a walk through your neighborhood. Are there certain areas where there are a lot of bees and butterflies? Why do you suppose the pollinators hang out there? What would your shopping cart look like without pollinators? A food market decided to take all the insect-pollinated foods off their produce shelves to see what it would look like. They ended up taking 52% of the produce off the shelves! You can see their before and after photos here. Go on a field trip to your local grocery store and see what you normally buy that is dependent on insects for pollination. How would it change the way you eat if those foods weren't available? Earth Day is Wednesday, and what better way to celebrate than to read about a real Earth hero. Wangari Maathai is known as the woman who encouraged other women to plant trees. She was born in a tiny village in Kenya, and learned to dig and plant her gardens in the shade of the big mugumo - a fig tree. 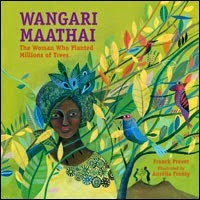 Her mother taught her that a tree is worth more than its wood- wisdom Wangari remembered for the rest of her life. Wangari is a fortunate daughter; she is sent to school. She attends college in the US, and when she returns to Kenya she sees that forests have been cut and wildlife is rare. Small farms have given way to large plantations, families can no longer grow food to feed their children, and rivers run muddy. Wangari sees her country eroding before her eyes. What can she do? She begins planting trees. Traveling from village to village, she speaks on behalf of the trees, and the animals, and the children. She asks people to think of the future, and creates tree nurseries to provide women with saplings. She starts the Green Belt movement. Tree by tree the women plant forests. But that is not enough. Wangari tells the president that he must stop cutting trees to put up buildings. She is threatened and jailed but still she believes that trees are important. She dreams that one day Kenya's children will be able to play in forests. She is the "mother of forests" and in 2004 was awarded the Nobel Peace Prize for her work. Review copy from local library. Bobbie and Joanie are cousins. Best cousins. You met them a couple years ago when Joanie needed glasses. Now Bobbie has a problem. She loves to invite Joanie over to play in her bedroom, but Bobbie's bedroom is too messy! It's no fun to play there because toys get lost and there's no room to sit down. So Mom lays down the law: "I'll give you two weeks to decide what stays and what goes. After that, I get to decide." What I like: This is a subject we can all identify with: clutter. And the need to declutter. And dreaming about what your room could look like given a chance to do-over. Bobbie, though, starts collecting things for her "new" room before she even gets rid of all the junk on her floor and under her bed and spilling out of the closet. Finally she asks her mom for help and together they clean and paint and fix and finally.... Bobbie has space to create the room she wants. Beyond the book: This book is perfect to read before Earth Day (which is next Wed). Why? Reuse. Bobbie and her mom strip and re-paint old furniture, making it "good as new". Bobbie also finds old barrels and crates that she "glams" up to use in her room. Reduce. Cut the clutter, Bobbie's mom says. Use less. Or at least figure out what you really need to keep, and a good way to store it (whether it's sports equipment, shoes, or unfinished manuscripts...). Do you really need all your stuff? What do you have in your room that you can get rid of? Recycle. One way to recycle is to figure out a new use for things. Like turning a box into a doll house, or making a stool by belting a stack of magazines together and putting a cushion on top. But there's only so many sock puppets and tin-can flower vases you can make, so sometimes you need to think of recycling outside the house. That's what Bobbie does. She holds a yard sale, but there are other ways of sharing old things that are still useable. What ways do people in your town use to recycle old furniture, tools, and other stuff? 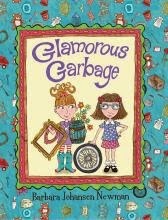 Today is PPBF (perfect picture book Friday) in which bloggers share great picture books at Susanna Leonard Hill's site. She keeps an ever-growing list of Perfect Picture Books. Review copy from the publisher. Katherine Amelia Evans, aka "Kitty", graduates from Leavenworth High School in the spring of 1926. She is sixteen-going-on-seventeen and already knows what courses she plans to register for when she heads to college in the fall. Until Daddy tells her that business isn't going well, and they won't be able to send both her and her older brother. Instead, she can work at the shoe store for a couple years... until things improve. Kitty has other ideas. She intends to be a journalist. And she'll do anything other than sell shoes. 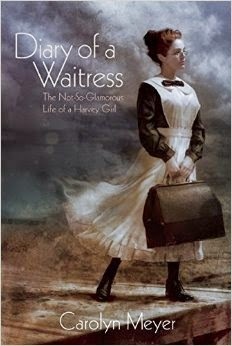 So when she sees an ad for young women to work as waitresses in the Harvey Eating Houses along the Sante Fe Railroad, she decides to apply. Even though the ad expressly says applicants must be at least 18 years old. Even though she has never been a waitress before. Even though it means going somewhere strange and living with rules. Lots of rules (no makeup; no jewelry; black shoes that must be kept polished). Being a Harvey Girl, it turns out, is hard work. The restaurants are at the train stations, and have both a formal dining room (jackets required) and informal lunch counters. Harvey girls must set the dining rooms up perfectly, with silver service just so, and serve the meals on a schedule so that when the trains come in for a water fill-up, they can feed the passengers and get them back on board in time for the scheduled departure. They must do this even when the customers are cranky and ill-tempered. And they must always have a smile and remain unruffled. Once trained, Kitty is sent off for a five-month tour-of-duty in a small town in New Mexico. Her job includes room and meals - though she'll eat once the paying customers have been served. She chronicles her adventures in her journal, honing her journalistic instincts and preserving memories to share with her family when she returns home. What I like about this book is that every so often there's a photo from the archives. I also like the author's note about how this story came to be, and which of the people in the story are real, and which characters are invented. For history buffs there is a bibliography and a list of photo credits. Today I'm sharing two books about animal heroes. The first is true stories. 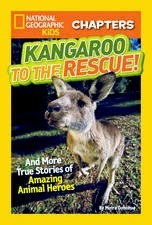 This book features stories about one kangaroo, two dogs, and three pigs. Lulu the kangaroo was a rescue animal. There are great descriptions of how her adoptive family raised her from a cat-sized joey to an adult. They made Lulu a pouch, figured out how to feed her, and helped her regain strength. Later, they encouraged her to go free, but she stayed close to the family. Good thing, too - because she ends up saving someone's life. Maggie and Pilot were two labs: one black, one blonde. They played chase, fetched balls, and served as mentors for young pups in training to be guide dogs. Later, when Maggie went blind, Pilot acted as her guide, sticking close and nudging her out of trouble. The last section tells stories of three not-so-little pigs who were brave and strong and helped people out of predicaments. One even received a gold medal from the ASPCA for saving her human companion's life. Salted in with the tales of animal bravery are sidebars and fact-boxes about the animals themselves. We learn about marsupials and why tails are important to kangaroos. There's information about guide dogs and therapy dogs, and pig social life. Did you know pigs can make over 20 different oinks, grunts, and squeals? And that pig mamas sing to their piglets? Review copy provided by publisher. On Sparky's birthday he got just what he always wanted: a K-9 cap, a K-9 collar, and a shiny K-9 badge. Now he can be a hero. But what would a "real" hero do? His first attempts fall through, and then he hears cries of a puppy in distress. Is it mean cats? A stolen bone? Cranky skunks? No, sighs the pup named Tidbit. It's a book. He can't read it. What's a hero to do? Sparky helps Tidbit through a few pages of the book - just this once, he says. 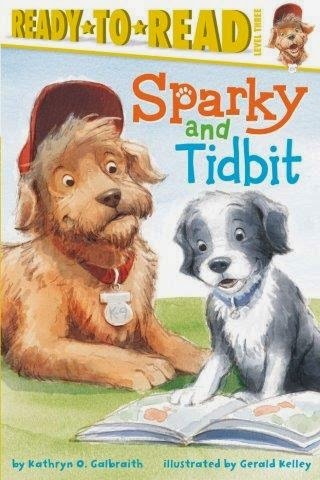 But the young pup is in need, and Sparky has a big heart, and before he knows it he is a "reading" dog. This is a "Ready to Read" book with language simple enough for early readers, and a fun story that will keep them turning to the next chapter. It's a great choice for reluctant readers who love dogs. It's also a great story for therapy dogs to share with their reading buddies. Review copy provided by Blue Slip Media. Today's review is part of the STEM Friday roundup. Drop by STEM Friday blog for more science books and resources. Stone Giant & a Winner! We've got a winner! The winner of Fatal Fever by Gail Jarrow is Danielle. Congratulations, and look for your copy in the mail. Now on to today's book.... which somehow got buried at the bottom of my book basket. Ever since I was a kid, I've been intrigued by Michelangelo, a Renaissance painter, sculptor, poet, and architect. His "real" name is Michelangelo di Lodovico Buonarroti Simoni which, if you try to say that all in one breath, is probably why most people simply called him Michelangelo. But I digress... this book begins with an enormous block of marble that is taking up space in the city of Florence. The city fathers wanted a statue of David - the heroic kid who felled a giant using only a sling, a stone, and his smarts. But things didn't turn out as they planned.... no sooner would an artist begin cutting into the stone than he'd quit or die. Nobody knew what to do with this huge block of marble. Not even Leonardo da Vinci. Until Michelangelo came to town. He looked at the stone.... and he saw what others didn't: the David who was waiting to be released. 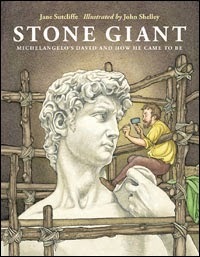 So Michelangelo built a shed around the block of stone and went to work with his hammers, chisels, and a special drill. It took a long time ~ three years ~ to chip the stone away from David, and Michelangelo stopped only when he had to eat or sleep. But finally, there he was. David. Ready to face Goliath. David has been standing for more than 500 years, but Sutcliffe breathes so much life into her story that you can almost hear the chiseling, and taste the marble dust floating in the air. The illustrations are warm, providing plenty of visual details. Plus there's back matter for curious readers. These crows love peanuts and plums, crickets and crackers. They are bold and sassy, dressed all alike in red stripes - except for that one, over there, with the long scarf. What I like: The sweaters. The long, long scarf that will surely get tangled up in a branch. The counting by threes - at least until we reach ten. Then it's adding one crow at a time, as if the extra crow will somehow unbalance them and cause them all to fall. 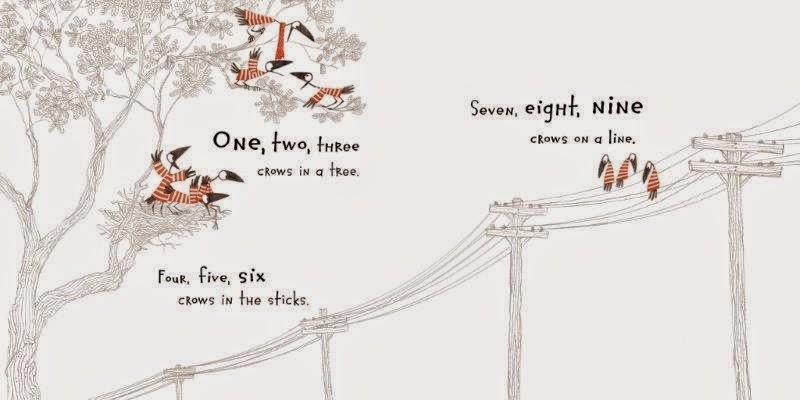 I like the way Appelt plays with words and images: twelve crows on a park bench wing by wing. And the disgusting things she has them eat: slimy snails. And the cat. Oh, that? Yeah, just a cat stretching and yawning and counting crow tails... and then all aflutter the crows take off. I love the artwork: black-and-white with just red. And the juxtaposition of striped and dots. The silly ways the crows hang out, or gather on a line. 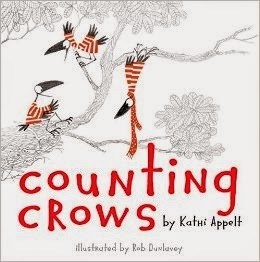 Beyond the Book activities: Crow talk. Do you have crows in your neighborhood? Go outside and listen for them. Crows have more than 20 calls, including a rattly call and beak-clacking. You can hear crow sounds here. Crow smarts. Crows use sticks and spines to get food out of tough places. But here's a video of a crow bending a bit of wire into a hook to pull a bit of food out of a tube. Crow play. Maybe you saw this video of a crow snowboarding down a roof. Here's the explanation for why some scientists think it might be playing. Today is PPBF (perfect picture book Friday) in which bloggers share great picture books at Susanna Leonard Hill's site. She keeps an ever-growing list of Perfect Picture Books. Review copy from Blue Slip Media.